I opened a separated forum section for discussions about the MIDIbox BLM, since this project is not tightly coupled with the MIDIbox SEQ project, but can also be used standalone. Just start to coordinate your efforts here. For me this was less time consuming than layouting and ordering PCBs, especially since at the time where I started this project it wasn't clear if the SRIO hardware will work stable - I used tricks that I never tried before to reduce the chip count. With the prototype I've proven that the concept is working, so that I can release the schematics for layout. If somebody really plans to build the circuit on verboard like me instead of waiting for the PCBs, be warned that you need some soldering experience, a lot of time and especially patience! It took me ca. 40 hours to complete the BLM16x16+X on verobards. With PCBs I expect only ca. 15 hours work, a more stable construction, and less risk for wiring errors (-> newbie friendly). To speed up the wiring I used "verowire" (german: "Fädeldraht"), and I used 7 x "H25PR200" veroboards which won't be required for a PCB based solution, therefore they are not listed in the list above. I strongly recommend you to order 300 LEDs/Buttons/Diodes as well although only 289 are used. E.g., at my order Reichelt only sent me 296 LEDs instead of 300 - good that these were spares! I had the remaining components for the 5 BLM_SCALAR modules + 1 PIC based MBHP_CORE already in my "personal stock". 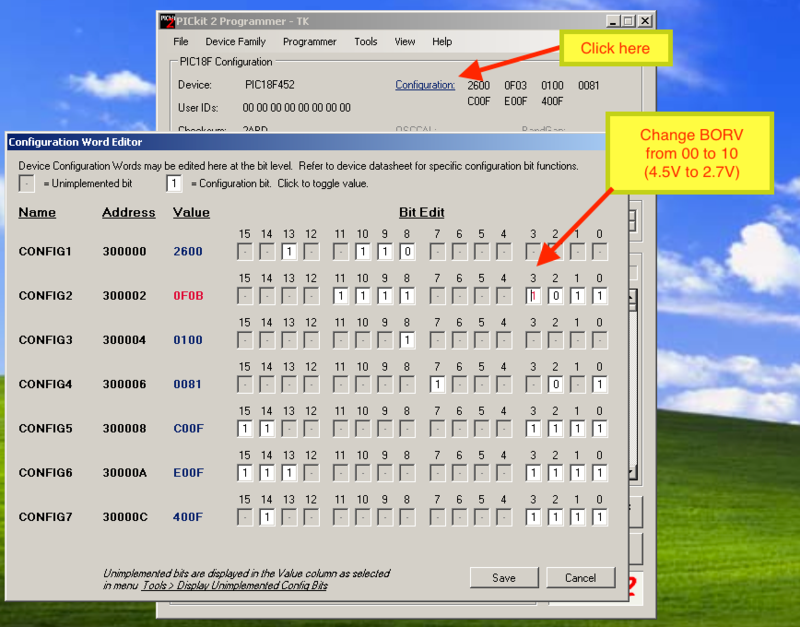 If you are interested in the part numbers you will find the references at the MBHP_DIN and MBHP_DOUT page. in the last months I got some mails about how a BLM layout could look like, and this only showed me that it will be very hard to find a universal solution. E.g., somebody proposed to prepare the layout for different button footprints. My comment: due to the increased amount of drill holes this will lead to much higher costs for everybody. My comment: this will increase the costs for everybody again, and it will be hard to find the same LEDs at such a high amount. E.g., consider only 30 people would like to join the PCB order - they would have to find ca. 8700 RGB LEDs from the same seller, or some of the people would have to buy more expensive RGB LEDs from a regular electronic shop. Another point that needs to be considered: for the BLM16x16+X I already chained 15 74HC595, MIOS8 supports 16 DOUT shift registers maximum. Increasing the amount of DOUT registers to control the blue LEDs will lead to difficult software changes. Third point: RGB LEDs draw much more current, especially more than Red/Green LEDs. Blue LEDs probably require additional transistors (or ICs) as source driver. The additional 74HC595 and these source drivers will require a different BLM_SCALAR module - again it doesn't make sense to bring this into an universal layout that is intended for my original project. I'm sure that most people will be happy about a cost efficient solution with Red/Green colour LEDs (like me). Buttons: this will also become a difficult topic. But I'm not sure if this construction will be stable enough. A better solution could be the usage of the same buttons and caps that where used on Wilba's MBSEQ frontpanel. the SRIO and BLM circuit has already been separated. The SRIO boards are stacked under the BLM board. For the BLM_SCALAR boards I recommend separate modules for each 16x4 matrix, because it is too difficult to plug the board into more than 2 large dual pin header sockets. Note that this approach would also allow you to use the same BLM_SCALAR boards for different BLM board designs! can be changed if really required. Therefore changes in the routing are only recommended for people with software programming skills. I will add 6 faders to my BLM16x16+X, because I find it important to get the possibility for manual sound changes with one hand, while sequences are changed with the other hand (therefore it's better to have the close to the matrix). The firmware is prepared for up to 8 pots/faders. However, my hope is that this will become a community project where experienced people will help out and where I don't need to support you that much! /Update Oct-2015: after 5 years finally we got a kit created by Latigid On! For those who haven't seen this thread: I have volunteered to design a PCB and matching panel. There are a few example pictures further down the thread. - I intend to design it in a way that will fit in a single chassis with Wilba's control surface PCB. This is my ideal scenario, as I already own this PCB and I haven't paid for front panel yet. It will however be simple to offer a modified version for standalone use. If I can find a free DXF editor I'm comfortable with (or get Inkscape's DXF export to work) I'll provide DXF files for those who don't want to use Ponoko. - My intention is to use the same button(TL1100F160Q)/cap(611-PEBK)/Bi-LED(859-LTL1BEKVJNN) combo as in Wilba's CS (mouser part numbers). I will consider adding additional footprints to the board, but will keep expense and usefulness in mind. Personally, I can't afford ready-made illuminated buttons of decent quality. Ideally I'd like the quiet ones described here: Seems that group buy died unfortunately. - I want my BLM to align with the buttons and encoders on the control surface. People who want a standalone BLM may want the 'square' format. I propose a BLM PCB that is (or can be) split down the vertical centre. This will allow both layouts. 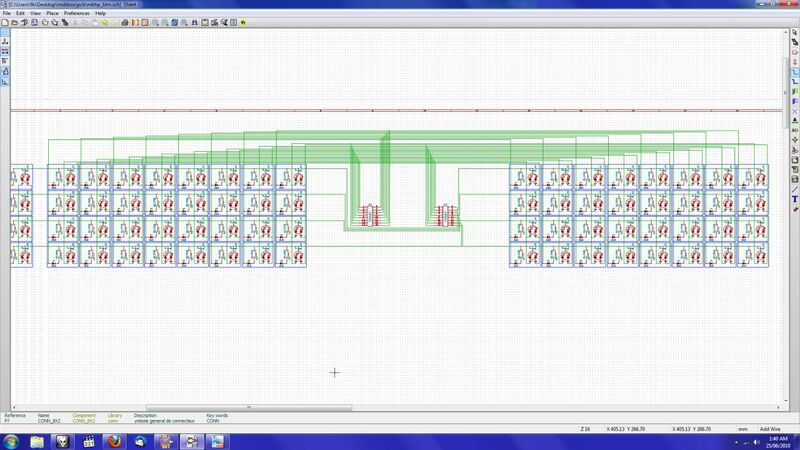 From looking at the schematic, each 16x4 section will require 31 wires to jump the gap. - I propose to have the BLM_Scalar module integrated on the button PCB. As with the above suggestion, I'm assuming this is feasible but I'm not experienced in such matters. - I have no experience with actually producing PCBs or panels. I have gotten the hang of both KiCad and Inkscape, so I think I will be able to achieve this with a few pointers from more experienced people. If any experts wish to take up this project, I'm happy to defer to them. Please offer your suggestions! I'm stuck on a 13" screen until the end of the week, so probably won't start work until then. having 10000 would not be hard (it is rather small in fact) . SMD would be a ggod alternative. We can negociate a good price as he deals with factories. 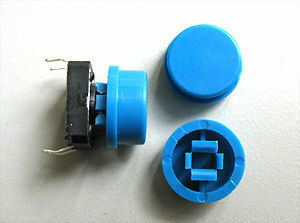 Buttons : from my experience, plastic buttons are clicky. 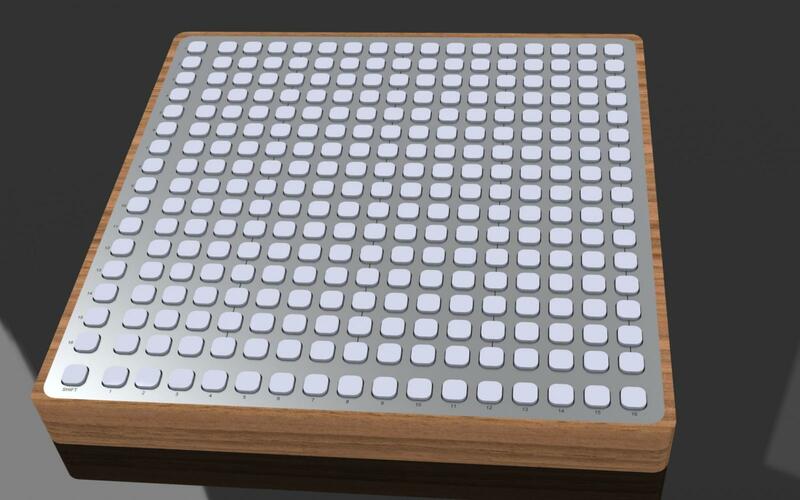 Rubber buttons like those in the monome are "middly" good. Those from Sparkfun are rather good. The guy who own livid sells 8x8 matrix buttons. for a big GB, he could make discount. A friend of mine own a plastic factory. I will talk to him about rubber buttons to have an idea of costs. Personnaly i would prefer all in one pcb (shift registers soldered on the back), even if it is SMD (it isn't hard to solder if you have Flux and a good video demo).sandwiched version with screws. In this case it could be a good idea to change the matrix structure to 8x8 instead of 16x4. This would give us 4 quarters, and between these modules there are only the SRIO connections to BLM_SCALAR modules. It would require some firmware changes, but so long only a second variant is required to simplify the HW, it would be ok. This isn't feasible with a double layer board, because there are too many crossing traces between buttons and LEDs. We would need to use a multi layer PCB, and thats expensive. dito, same problem with crossing traces. Please identify the costs before this discussion goes into the wrong direction. So, we have already three plans that contradict each other - are there other opinions; how should your BLM16x16+X look like. Using your Ikea case idea the approximate size is 30 cm EDIT: by 40 cm. So approx. 7 rack units, plus a Wilba/TK SEQ is 10. That's quite a bit of real estate, and I'm wondering whether the SEQ belongs in the rack (MIDI'd to your synths) and the BLM on a keyboard stand/ table/ hand-held as a real performance instrument. I'd say people will have a lot of opinions on which buttons to use, my humble suggestion is to keep the layout as general as possible so peeps can choose. 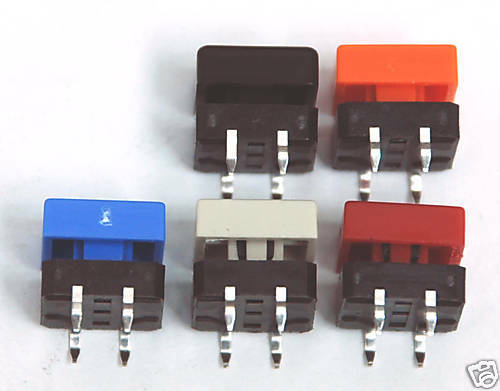 SPST tact switches usually have 200 mil pin spacing, correct? TK. Just wanna say great work. Did you like your circular rubber button matrix idea that you were testing? I would think that everyone would of course want a pcb design but what would that cost roughly? Anyone? Vero board is a lot cheaper in this case right? Either way you look at it, it will be a one time job for most of us and 40 hours of build time seems right for something so massive. If a pcb board gets broken down into sections will that reduce the cost at all? Being able to use self made panels and common switches/buttons (round type) would get a lot more of these babies in action. To keep costs down I think a simple sheet metal panel of whatever type only cut to size with holes drilled by yourself for round switches and round leds would be a very cost effective panel solution. If you have access to someone/equipment that can cut a big and simple square piece of metal. From then you just get a ruler out and pencil you drill holes and get drilling. The you could write in sharpie, label maker or use the adhesive printing paper technique to get your text on the panel. When you get a chance could you possibly take a close up picture of the wiring on the back of the veroboard and add some text to describe what is where and where its going? I never figured out the button matrix for my MBFM because I don't quite understand certain aspects of schematics. If this seems to be a waste of time please disregard this last paragraph. I am feeling cheap right now and wanna get excited making a veroboard version. From my experiences with the BLM16x4 that I built into a rack case a separate BLM that sits flat on the table is definitely better than a rack mounted option! I haven't got the new rubber button order yet, and will need a frontpanel before I'm able to mount them. Before other people are trying this, I recommend to wait for my tests. 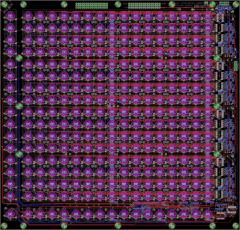 I would think that everyone would of course want a pcb design but what would that cost roughly? Anyone? I assume ca. 50 EUR - no? Vero board is a lot cheaper in this case right? You would save 35 EUR, but would get a robust and easy to solder solution in return. Either way you look at it, it will be a one time job for most of us and 40 hours of build time seems right for something so massive. If a pcb board gets broken down into sections will that reduce the cost at all? When you get a chance could you possibly take a close up picture of the wiring on the back of the veroboard and add some text to describe what is where and where its going? The cables are so thin, and the circuit is so large that a picture doesn't really help. The schematic http://www.ucapps.de/mbhp/mbhp_blm_map.pdf gives you a better overview, but if it doesn't make sense to you, it's definitely better to wait for a PCB, because otherwise chances are high that you've to spend much more time to find and fix wiring errors!!! Well if its only that much I wouldn't mind hearing from US and euro distributors. I am just concerned if it is decided to go with Wilba's rectangular buttons from seq run because that would mean a professionally cut panel would be pretty much required instead of drilling holes ourselves using circular buttons/leds if we wanted that option. I am just concerned if it is decided to go with Wilba's rectangular buttons from seq run because that would mean a professionally cut panel would be pretty much required instead of drilling holes ourselves using circular buttons/leds if we wanted that option. The same button caps need not be used with those buttons - perhaps there are circular ones available? i used these ebay tact switches on wilba's seq cs pcb. round = only one colour, blue. also available with square tops and 5 colours. I'd prefer a monomeish solution with rubber buttons. To size it like the sequencer LCDs sounds like a good idea. Then it was easy to use the switch with transsparent cap. Is a 2 pin duo led even possible? Yes, but it's more like two diodes arranged back-to-back. Unfortunately you can't then use both LEDs at the same time, so you couldn't have a third "orange" state. The addressing of each LED state becomes a bit tricker too (I think). TK, do you think 3mm LEDs would work alright with your illuminated button concept? 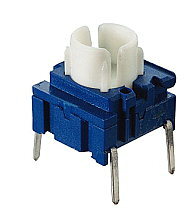 Switches: E-Switch TL1105SP - 7.5mm to top of actuator. LED: 3mm duo as used in Wilba's CS order. 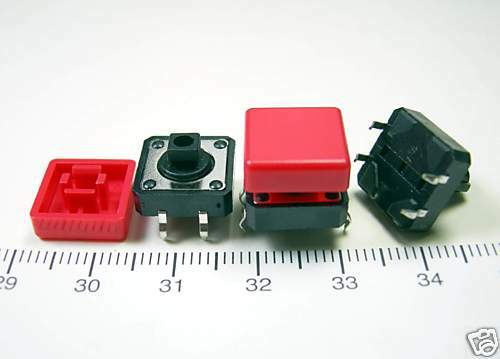 Mouser: 859-LTL1BEKVJNN - 6.7mm min height. 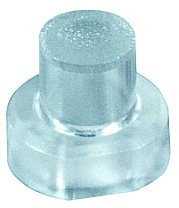 Button caps: There is a matching round cap for those who want to drill their own panels, Mouser: 612-1R-BK, and also other shapes. It would also be possible to do a solution like TK's cheap illuminated buttons. Also I'm thinking it might be possible to use the silicon sheet, and have nice looking laser cut acrylic glued on top as buttons instead of the rubber feet. This would hopefully give a nice feel. TK, do you plan to create this schematic? I have my new monitor now, I will start PCB and frontpanel design work soon. I'll start with the BLM_SCALAR modules. The 8x8 based variant would look similar, but currently I don't have the time to draw the schematic. You would create a schematic anyhow, so let's save this effort - I will explain it instead. Do you see the logic behind this matrix routing, or do you need additional explanations? Can you please explain the connection of the extra column and row to J3_5,J4_5? I am a big fan of the 8x8 version too, because i think it is more versatile. Anyway seems to be a very common way of design when researching other sources like monome, arduino, livid, etc. man, those 8x8 sheets look nice and for $130, not to painful on the wallet for the big one..